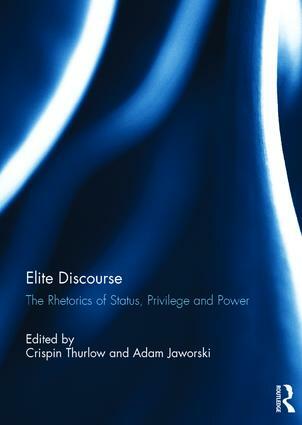 Elite Discourse examines how language and communication – or just discourse – define, mediate and legitimize class privilege. It does so from the perspective of those people and places who often stand to gain most from inequality. Collectively, chapters consider language and communication that is elitist in its appeal to distinction, excellence and superiority; they also describe the ways in which various groups and institutions lay claim to ‘eliteness’ as a way to position themselves (or to be positioned by others) as elite or non-elite. As such, chapters are concerned as much with discourse about elite status as they are with the discourse of elites – those groups commonly defined by their material wealth, political control, or demographic rarity. Ultimately, Elite Discourse views ‘elite’ as something we do, rather than something we necessarily have or are. Indeed, elite status and eliteness point us to the rhetorical strategies by which many people differentiate themselves and by which they access symbolic-material resources for shoring up their status, privilege and power. This book was originally published as a special issue of Social Semiotics. Crispin Thurlow is Professor of Language and Communication in the Department of English at the University of Bern, Switzerland. Adam Jaworski is Chair Professor of Sociolinguistics in the School of English at the University of Hong Kong. ?